11/03/2015: Minor reorganization, added a 1907 advertisement for a "Champion Ratchet Wrench" set. 10/29/2015: Added a 1911 advertisement for a "Champion Ratchet Wrench" set. 11/21/2011: Added an early notice for a pressed-steel socket set. 05/28/2011: Added a Flyer for "Sampson" Socket Set. 05/27/2011: Added a Syracuse Wrench "Yala" Socket Set. 05/26/2011: Added a Syracuse Wrench 5/8-Drive Screwdriver Bit. 05/23/2011: Minor update to history section. 09/09/2010: Added a Syracuse Wrench 5/8-Drive 6 Inch Extension and a Syracuse Wrench 5/8-Drive Universal. 09/08/2010: Added a Syracuse Wrench 5/8-Drive Sliding Tee Head, a Syracuse Wrench 5/8-Drive 10 Inch Extension, and Syracuse Wrench 5/8-Drive Hex Sockets. 09/07/2010: Added a Syracuse Wrench Early No. 2 "Champion" Socket Set and a Syracuse Wrench 5/8-Drive Ratchet. 08/06/2010: Moved to a separate page, added a Syracuse Wrench 1/2-Drive 8 Inch Extension. 08/05/2010: Added a Syracuse Wrench "Ford Special Wrench" Socket Set and a Syracuse Wrench No. 752 11/16-Drive Extension. 08/04/2010: Added a Syracuse Wrench Later No. 2 Champion Socket Set and a Syracuse Wrench 1/2-Drive Universal. 08/03/2010: Added a Syracuse Wrench No. 852 11/16-Drive Extension. 08/02/2010: Added a Syracuse Wrench No. 770 11/16-Drive Ratchet. 07/29/2010: Added a Syracuse Wrench No. 2 Champion Socket Set. 07/25/2010: Added a Syracuse Wrench 1/2-Drive Ratchet. 05/07/2009: Added a Syracuse Wrench Valve Lapper. The Syracuse Wrench Company was an early maker of socket sets and automotive tools based in Syracuse, New York. The Syracuse Wrench Company was founded in 1906 and was advertising products by January of 1907, based on an advertisement found in a trade journal. The notice at the left from the 1909 issue of Motor Cyclopedia states that the company was established in 1906 and lists the address as 500-502 West Water Street in Syracuse. However, the surname of the president is misspelled ("Yackel" should be "Yachel"), and other entries in the same publication give the address as 300-302 West Water Street or as Franklin and Water Streets, casting some doubt on the accuracy of the information. The correct company officers are believed to have been Edward O. Yachel, president; Edward O. Yachel, Jr., vice-president; and Edgar H. Lewis, secretary and treasurer. The correct address appears to be 300-302 West Water Street, as this is at the intersection of Franklin and West Water. Syracuse Wrench is listed in Kenneth Cope's book American Wrench Makers 1830-1930, 2nd Edition (AWM2e), which gives the founding year as 1907 and closing year as 1923. We haven't been able to confirm these dates from other sources, but the years seem reasonable based on other observations. The book shows illustrations for six different socket set models, but unfortunately (and uncharacteristically) does not provide a source or date for the illustrations. Syracuse Wrench offered its early socket sets under the "Champion" and "Yala" brands. The full-page advertisement at the left is currently our earliest reference to the company's products and was published on page 171 of the January 1, 1907 edition of the Automobile Trade Directory. The ad shows a "Champion Ratchet Wrench" No. 2 socket set in great detail, with examples of some of the possible configurations in the upper part of the illustration, and an inset showing the individual tools in the lower part. Note the text "Set No. 2" just above the inset. The ratchet shown in the illustration is based on patent #873,977, filed by J.J. Albrecht in 1906 and issued in 1907. The recent discovery (November 2015) of this ad has greatly improved our understanding of the company, as it rules out an earlier hypothesis that Syracuse Wrench might have been the successor to the Miller Combination Tool Company, another early socket maker. Instead, we can see that both of the companies were offering products in early 1907. Syracuse Wrench also offered a smaller socket set under the "Yala" brand. The illustration at the left, published in the March 25, 1908 issue of The Horseless Age, shows an early Yala socket wrench set. The Yala set was a smaller collection of sockets and tools furnished in a leather case, and was probably intended as an emergency repair kit for early automobiles. 1909 Listing for "Champion Ratchet Wrench". The "Champion" socket sets were typically furnished in wooden boxes, although a canvas roll version may have been available. The catalog listing at the left shows an early "Champion Ratchet Wrench" set in a wooden box, consisting of hex and square sockets with a ratchet, Tee handle, and other tools. This listing is from a 1909 catalog by A.J. Wilkinson & Company, a dealer of automobile supplies in Boston, Massachusetts. This is currently our earliest catalog reference for Syracuse Wrench, although the company name is not directly stated. One interesting aspect of the early socket sets made by Syracuse Wrench is that the sockets were made of malleable iron castings, typically with the socket size cast into the side. The sockets and tools in these early sets were sometimes finished in highly polished nickel plating, giving them a very different appearance than the more typical plain finishes offered by most other makers of that time. 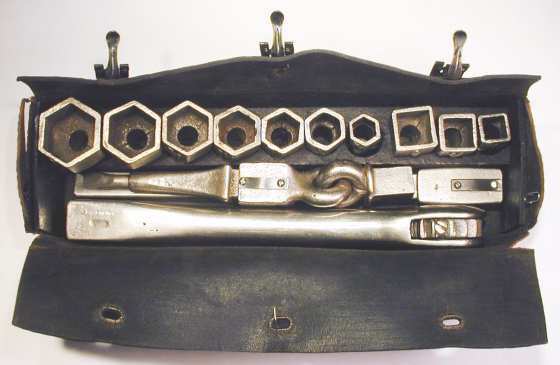 The "Champion" socket set was notable for its striking resemblance to the "Giant" socket set produced by the Miller Combination Tool Company, which operated in Syracuse somewhat earlier than Syracuse Wrench. In particular, the Tee handle closely resembles the Miller 1907 patent, and the box of tools is arranged the same way as an early Miller Combination set. 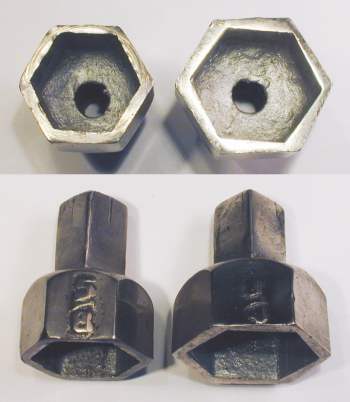 The main differences between the sets are the use of a different ratchet design and the use of malleable iron castings by Syracuse Wrench, instead of the brass (or "silver metal") castings of the earlier company. The designs for the tools and the use of malleable iron suggest that Syracuse Wrench must have been highly influenced by the work of Charles Miller, whose patented designs were produced by the Miller Combination Tool Company and later by Charles Miller Company. These similarities led to an earlier hypothesis is that Syracuse Wrench might have been the successor to the Miller Combination Tool business, as the latter company disappears from the public record after 1907. By late 1915 Syracuse Wrench was offering socket sets with pressed-steel sockets, the more typical construction used for sockets at that time. The illustration and notice at the left appeared in the December 1916 issue of The Accessory and Garage Journal and describes the Champion No. 12 socket set. The text notes that the set includes pressed-steel sockets with 23 hex sizes and 11 square sizes. Note that the ratchet visible in the illustration matches the Fine-Tooth Ratchet shown in a later figure. Syracuse Wrench sockets were interchangeable with the standard Mossberg sockets, and it's not unusual to find Mossberg-marked sockets mixed into the sets. The illustration at the left, published in a 1918 issue of The Horseless Age, shows the Champion No. 99 "Garage Kit" available at that time. Although not stated in the text, the sockets in this set appear to be of pressed-steel construction. The pressed-steel socket sets were supplied with two different types of ratchets, one with a distinctive Fine-Tooth Ratchet using a drive gear held in a pivoting carrier, and the other a more conventional No. 770 Ratchet with an 11/16 female drive gear and a formed sheet-metal body, similar to the Mossberg No. 355 ratchet. The sets with the conventional No. 770 ratchet are believed to have been produced later, as the tools in these sets were typically stamped with a model number and company logo, instead of the unmarked tools found in earlier sets. In the absence of proper catalog information, the illustrations in Cope's AWM2e book provide an outline of some of the sets offered by Syracuse Wrench. Starting with the smallest set, the illustrations show the "Ford Special" with six sockets, the No. 77 Champion with 10 sockets, the No. 1 Champion with 16 sockets, the No. 6 Champion with 17 sockets, the No. 2 Champion with 19 sockets, and the No. 10 Champion with 30 sockets. All of the sets include a ratchet, drive plug, and extension, and most include a universal joint as well. The ratchets in the illustrations are all of the Fine-Tooth Ratchet design. No trademarks are known to have been registered by Syracuse Wrench. The company used the brands "Yala" and "Champion" for its products. The Syracuse Wrench Company is mentioned briefly in American Wrench Makers 1830-1930, 2nd Edition by Kenneth Cope (Astragal Press, 2002), referred to as AWM2e in the text. Currently we don't have any catalog references for Syracuse Wrench products. Socket sets made of malleable iron were probably the earliest tools offered by the Syracuse Wrench Company. Currently we have several examples of these sets being prepared for display. Earlier in this article we showed a 1907 advertisement for a "Champion Ratchet Wrench" set, which was identified as our earliest advertising reference for Syracuse Wrench. A very similar ad can be found on page 155 of the January, 1908 edition of The Automobile Trade Directory. Both of these early advertisements identify the tools as a "Champion Ratchet Wrench" No. 2 set. Fig. 1 shows a somewhat later ad for a "Champion Ratchet Wrench" socket set, published on page 581 of the July, 1911 edition of The Automobile Trade Directory. The illustration shows the set in a wooden box with a label on the lid, which identifies it as a No. 2 set, although it's a bit difficult to read. The tools in the set appear to be same as those in the earlier advertisements and in the 1909 catalog listing above. Our next figure shows a fine example of this same Champion No. 2 set. Fig. 2. Syracuse Wrench Early No. 2 "Champion Ratchet Wrench" Socket Set, ca. 1907-1912. Fig. 2 shows an early Syracuse Wrench "Champion Ratchet Wrench" No. 2 socket set of malleable iron construction. The set consists of a ratchet, Tee head, two extensions, universal, screwdriver bit, drilling attachment, eight hex sockets, eight square sockets, and a spark plug (deep) socket. Of the tools in the set, only the ratchet is marked with the company name. The printed label on the lid is marked "One Set" and "Champion Ratchet Wrench" at the top, with "Manufactured by Syracuse Wrench Co." and "Syracuse, N.Y. U.S.A." in the middle, and with "No. 2" and "Nickel Finish" at the bottom. This set is nominally 5/8 square drive, with the sockets equipped with 5/8 square male drive tangs and the drive tools offering a matching 5/8 square opening. 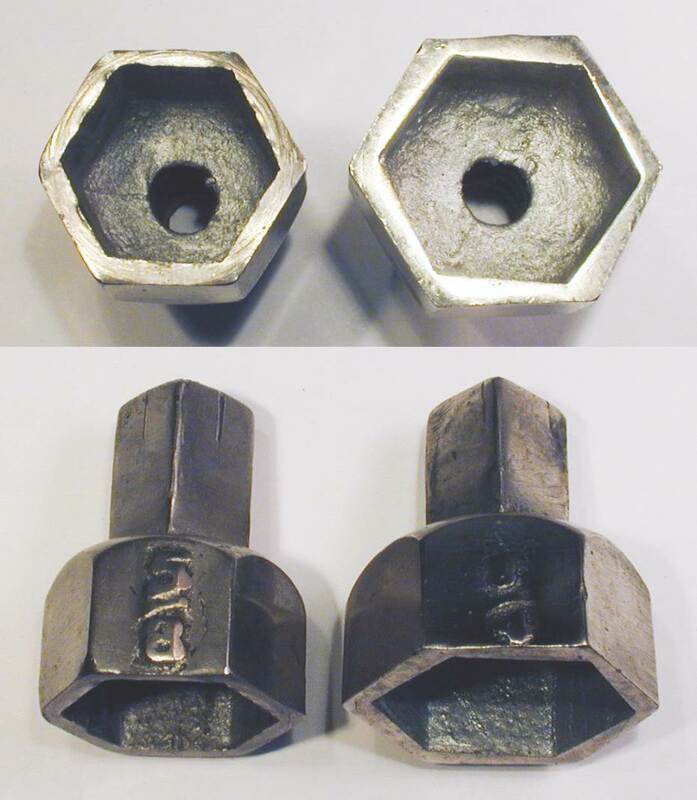 The hex sockets have cast-in size markings using the U.S.S. Size Convention, and the openings have an approximate 1/32 oversize allowance. The marked and nominal sizes are, from the left, 1/4 (1/2), 5/16 (19/32), 3/8 (11/16), 7/16 (25/32), 1/2 (7/8), 9/16 (31/32), 5/8 (1-1/16), and 3/4 (1-1/4). The square sockets also have cast-in size markings and follow the same sizes as the hex sockets. The marked and nominal sizes are, from the left, 1/4 (1/2), 5/16 (19/32), 3/8 (11/16), 7/16 (25/32), 1/2 (7/8), 9/16 (31/32), 5/8 (1-1/16), and 3/4 (1-1/4). The set was furnished in a nicely made wooden box with finger-jointed corners, with approximate dimensions 12.6 inches wide by 5.5 inches deep by 3.4 inches high. No markings were found on the outside of the box. Fig. 3. 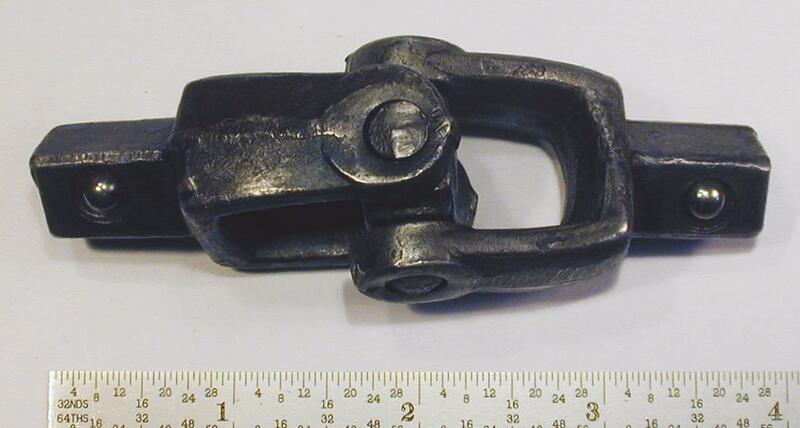 Syracuse Wrench Early 5/8-Drive Ratchet, with Insets for Side View and Marking Detail, ca. 1907-1912. Fig. 3 shows the Syracuse Wrench 5/8-drive ratchet from the No. 2 "Champion" socket set, stamped with "Syracuse Wrench Co." and "Syracuse, N.Y." on the handle, with a "Pat. Dec. 17, '07" patent date on the reverse. The overall length is 9.5 inches, and the finish is nickel plating. The patent date refers to patent #873,977, filed by J.J. Albrecht in 1906 and issued in 1907. The ratchet uses malleable iron construction for both the body and drive gear. The relatively coarse drive gear has 12 teeth and is equipped with a detent ball to hold a socket. Fig. 4. Syracuse Wrench 5/8-Drive Sliding Tee Head with Extension Cross-Bar, ca. 1907-1912. Fig. 4 shows the unmarked 5/8-drive sliding Tee head from the Syracuse Wrench No. 2 "Champion" socket set, with the long extension inserted as a cross-bar. The overall length of the extension cross-bar is 10.1 inches, and the height of the Tee head is 3.4 inches. The finish is nickel plating. The Tee head has a 5/8 opening at the bottom for a socket (or extension), with a detent ball backed by a flat spring to secure the tool. In addition to its use as a sliding Tee handle, the Tee head could be used as a short extension, with the ratchet driving the 5/8 tang at the top. Fig. 5. Syracuse Wrench 5/8-Drive 10 Inch Extension, ca. 1907-1912. Fig. 5 shows the unmarked 5/8-drive 10 inch extension from the Syracuse Wrench No. 2 "Champion" socket set. The overall length is 10.1 inches, and the finish is nickel plating. The extension has a 5/8 opening for a socket, with a detent ball backed by a flat spring to secure the tool. In operation, the square bar of the extension can slide freely in the ratchet drive gear, making this effectively a variable length extension. Fig. 6. Syracuse Wrench 5/8-Drive 6 Inch Extension, ca. 1907-1912. Fig. 6 shows the unmarked 5/8-drive 6 inch extension from the Syracuse Wrench No. 2 "Champion" socket set. The overall length is 6.3 inches, and the finish is nickel plating. Fig. 7. Syracuse Wrench 5/8-Drive Universal, ca. 1907-1912. Fig. 7 shows the unmarked 5/8-drive universal from the Syracuse Wrench No. 2 "Champion" socket set. The overall length is 3.8 inches, and the finish is nickel plating. The universal has a 5/8 opening for a socket, with a detent ball backed by a flat spring to secure the tool. Fig. 8. Syracuse Wrench 5/8-Drive Screwdriver Bit, ca. 1907-1912. Fig. 8 shows the unmarked 5/8-drive screwdriver bit from the Syracuse Wrench No. 2 "Champion" socket set. Fig. 9. Syracuse Wrench 5/8-Drive Hex Sockets, with Inset for Service Opening, ca. 1907-1912. Fig. 9 shows the two largest 5/8-drive hex sockets from the Syracuse Wrench No. 2 "Champion" socket set, each marked with the (U.S.S.) size cast into the side. The marked and nominal sizes are, from the left, 5/8 (1-1/16) and 3/4 (1-1/4). The finish is nickel plating. The Syracuse Wrench "Yala" socket set was a compact collection of tools intended as an emergency repair kit for motorists. This set was one of the company's first products and came at a time when both automobiles and socket sets were still novelties. Fig. 10. 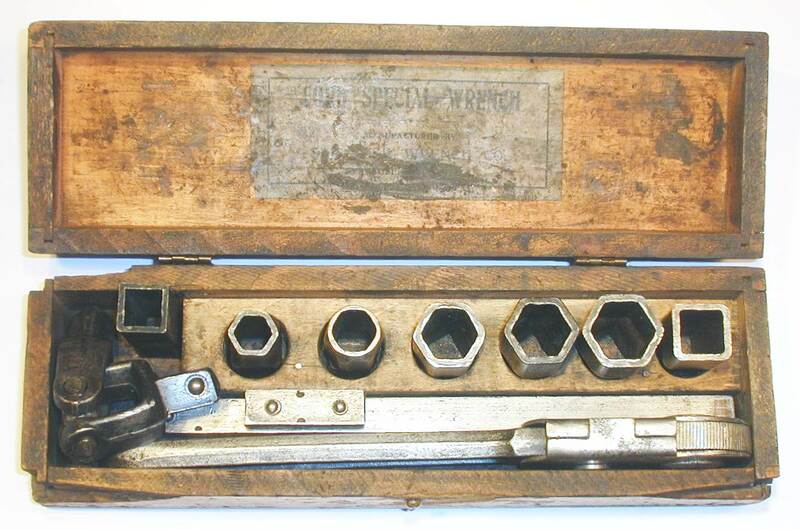 Syracuse Wrench "Yala" Socket Set, 1908. Fig. 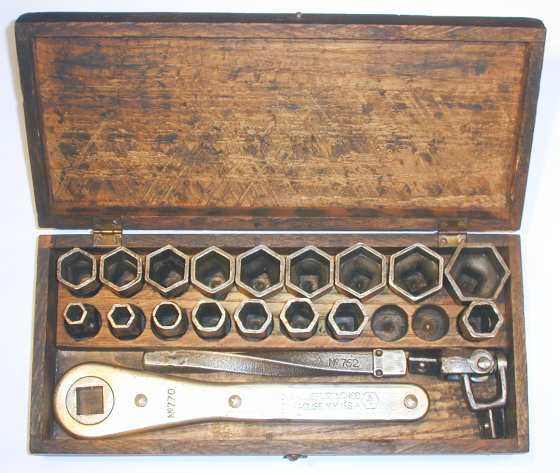 10 shows an early Syracuse Wrench "Yala" socket set in its leather case, consisting of a ratchet, extension, universal, screwdriver bit, seven hex sockets, and three square sockets. Originally the set would have included a spark plug (deep) socket as well, but this socket was missing when the set was acquired. The set is marked with "Yala Auto" and "Syracuse Wrench Co." embossed on the top flap, as shown in the next figure. Of the tools in the set, only the ratchet is marked with the company name. The sockets are all marked with the size cast into the side using the older U.S.S. Size Convention. The hex socket nominal sizes and markings are, from the left, 1-1/16 (5/8), 31/32 (9/16), 7/8 (1/2), 25/32 (7/16), 11/16 (3/8), 19/32 (5/16), and 1/2 (1/4). As the cast openings are slightly irregular, the measured sizes are generally a bit larger than the nominal size. The square socket nominal sizes and markings are, from the left, 11/16 (3/8), 19/32 (5/16), and 1/2 (1/4). The drive tools in the "Yala" set are basically identical to the examples shown for the early Champion No. 2 set in a later figure, so we will simply reference the Champion tools rather than adding repetitive photographs. The drive tools consist of Ratchet, a 10 Inch Extension, a Universal, and a Screwdriver Bit. As with the Champion No. 2 set, the tools and sockets in the "Yala" set use a nominal 5/8 square drive size. Fig. 11. Top View of Syracuse Wrench "Yala" Socket Set, 1908. Fig. 11 shows a top view of the "Yala" socket set in its leather case, marked with "Yala Auto" embossed in an oval design on the top flap, with "Syracuse Wrench Co." along the top edge and additional text along the bottom. The markings are shown in greater detail in the figure below. The case is well made, with three clasps on the top to secure the cover and a wooden insert inside to hold the sockets. The dimensions of the case are approximately 11.0 inches long by 3.3 inches deep by 3.0 inches high. Fig. 12. Detail for "Yala" Socket Set Embossed Label, 1908. Fig. 12 shows a close-up view of the embossed label for the "Yala" socket set, marked with "Yala Auto" in script in the center of an oval design, with "Syracuse Wrench Co." along the top edge and "Syracuse, N.Y." partially readable along the bottom edge. Fig. 13. Sampson Socket Set Flyer, 1908. The "Yala" Socket Set was acquired with a small paper flyer inside, which revealed an interesting alternate identity as the "Sampson" socket set, and provided valuable contextual information as well. Fig. 13 shows a scan of the small flyer found with the "Yala" socket set, identifying the set as the "Sampson Socket Set" and providing a nice illustration and description. Although this side of the flyer is not marked with a company name, the reverse side illustrates a grease gun offered by the Beckley-Ralston Company, an early dealer and distributor of automobile accessories based in the Chicago area. In addition, a careful look at the illustration for the Sampson set shows the Beckley-Ralston "BR Co." logo on the upper cover flap. This flyer is significant in providing an early date for our "Yala" socket set, as well as demonstrating that Syracuse Wrench had established distribution channels by that time. Beckley-Ralston published catalogs for mail-order sales, and having B-R as a distributor would have given Syracuse Wrench a national footprint for sales. By late 1915 Syracuse Wrench was offering socket sets using pressed-steel sockets, the dominant type for sets made before 1920. The advertisement at the left appeared on page 99 of the December, 1915 issue of Pacific Motor Boat and describes the "Champion Ratchet Wrench" No. 2 socket set. The text lists the contents as consisting of a ratchet, extension bar, universal, 19 hex sockets, and a double-ended spark-plug socket. We are fortunate to have a No. 2 Champion Socket Set for your viewing pleasure. The notice at the near left appeared on page 27 of the December 10, 1916 issue of The Automobile Journal and describes the "Champion Ratchet Wrench" No. 10 socket set. The text lists the contents as consisting of a ratchet, offset handle, extension, universal, 23 hex sockets, seven square sockets, and one spark-plug socket. The company's largest set was the No. 99 "Garage Set", shown in the notice at the left from page 44 of the October, 1916 issue of The Accessory and Garage Journal. The company also produced a very similar No. 100 "Garage Set". The smallest of the Syracuse Wrench socket sets was the "Ford Special Wrench" set, a collection of sockets and tools for Model T maintenance. Fig. 14. Syracuse Wrench "Ford Special Wrench" Pressed-Steel Socket Set, ca. 1916+. Fig. 14 shows a Syracuse Wrench "Ford Special Wrench" socket set, consisting of a fine-tooth ratchet, drive plug, extension, universal, five hex sockets, and two square sockets. The printed label on the lid is marked "Ford Special Wrench" at the top, with "Manufactured by Syracuse Wrench Co." in the middle. The bottom line is only partially legible, but is likely "Syracuse, N.Y. U.S.A." by comparison with other sets. The socket sizes are, from the left, 15/32, 17/32, 21/32, 23/32, 25/32, and 19/32 (square). The smaller square socket at the far left is a 17/32 size, intended primarily as a coupling for the universal and extension. The "Ford Special" set was furnished in a wooden box with dimensions (in inches) 10.5 wide by 3.3 deep by 2.8 high. No markings were found on the outside of the box. When acquired, this socket set was missing several of the original tools, and the sockets had all been replaced by Mossberg sockets of various sizes. The set was reconstructed for the photograph using two references: the illustration in Cope's AWM2e book, and a similar socket set produced by Syracuse Wrench for Smith & Hemenway. The illustration in AWM2e clearly shows this set with a ratchet, drive plug, extension, universal, six sockets, and an apparent coupling. The specific sizes for the sockets were obtained from the label of the No. 1971 "Ford Car Special Set", a version of this set produced for Smith & Hemenway. Fig. 15. Syracuse Wrench 1/2-Drive 8 Inch Extension. Fig. 15 shows the unmarked 1/2-drive 8 inch extension from the Syracuse Wrench "Ford Special" set. One detail to note is that only one end of extension has a detent ball and stop tabs. This allows the opposite end to slide through the ratchet drive gear as a variable length extension. This next figure shows the pressed-steel version of the No. 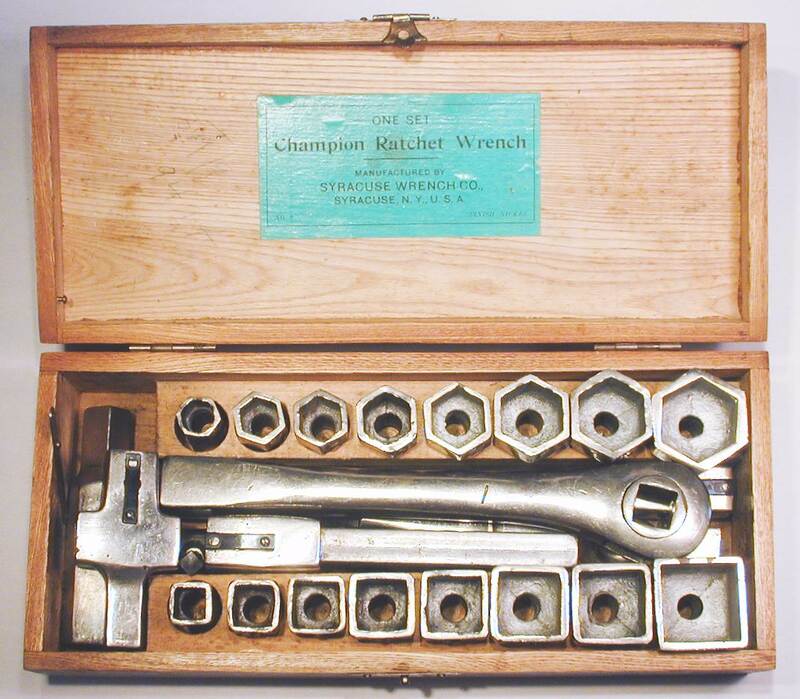 2 "Champion Ratchet Wrench" set shown in a prior figure. Fig. 16. Syracuse Wrench No. 2 "Champion" Pressed-Steel Socket Set. Fig. 16 shows a Syracuse Wrench No. 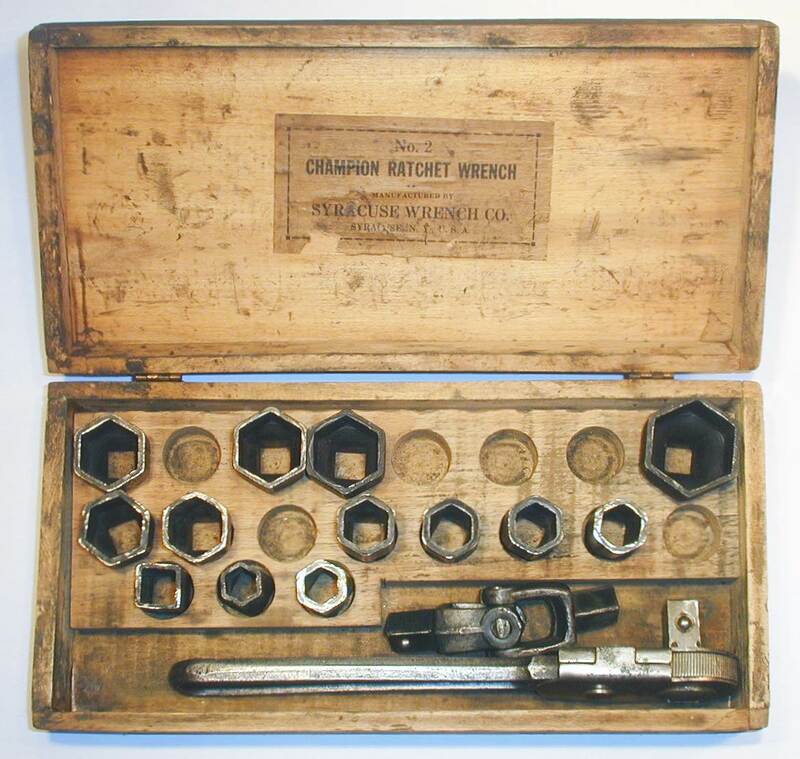 2 "Champion" pressed-steel socket set, consisting of a fine-tooth ratchet, drive plug, universal joint, and a selection of 19 sockets (with several missing). The original set probably included an extension and possibly a spark-plug socket, as well as additional sockets to occupy the holes. The printed label on the lid is marked "No. 2 Champion Ratchet Wrench" at the top, with "Manufactured by Syracuse Wrench Co." in the middle and "Syracuse, N.Y. U.S.A." at the bottom. The 1915 advertisement shown above lists the hex socket sizes as 15/32, 1/2, 17/32, 19/32, 5/8, 21/32, 11/16, 23/32, 25/32, 13/16, 27/32, 7/8, 29/32, 31/32, 1, 1-1/32, 1-2/32, 1-5/32, and 1-9/32. The sockets in the photograph are, in the front row from the left, 17/32 (square), 15/32, and 1/2. The sockets in the middle row from the right are 19/32, 5/8, 21/32, 11/16, 13/16, and 27/32, and the sockets in the back row from the left are 29/32, 31/32, 1 Inch, and 1-9/32. This set show signs of extensive replacement of sockets, as more than half of them (8 of 13) are marked with the Mossberg M-Diamond logo. The remaining five are presumed to be the original sockets supplied with the set, and these are marked with just the fractional size. As a side note, it's not unusual to find numerous replacements in a pressed-steel socket set, as this type of socket (from any manufacturer) was prone to breakage. The predominance of Mossberg sockets is probably due to the ease of purchasing these as replacements. The No. 2 Champion socket set was supplied in a wooden box with dimensions 11.5 inches wide by 5.5 inches deep by 3.0 inches high. No markings were found on the outside of the box. Fig. 17. Syracuse Wrench 1/2-Drive Ratchet Wrench, with Inset for Side View. Fig. 17 shows the 1/2-drive fine-tooth ratchet and drive plug acquired as part of the Syracuse Wrench No. 2 "Champion" pressed-steel socket set. The ratchet is unmarked. The overall length is 9.2 inches, and the finish is plain steel. This ratchet has a distinctive design with a pivoting sheet metal carrier holding the fine-tooth drive gear. A spring holds the drive gear in contact with pawl teeth in the end of the forged handle. This design is probably covered by a patent, but no patent date or number is marked and we haven't been able to locate a patent yet. Fig. 18. Syracuse Wrench Later No. 2 "Champion" Pressed-Steel Socket Set. Fig. 18 shows a later edition of the Syracuse Wrench No. 2 "Champion" pressed-steel socket set, consisting of a No. 770 ratchet, a No. 752 extension, an unmarked universal joint, and a selection of 19 sockets (with two missing). The original set probably included a spark-plug socket as well. This set no longer has a label for identification, but is believed to be the No. 2 Champion set by comparison with an earlier No. 2 Champion set. The sockets in the front row are, from the left, 13/32, 15/32, 17/32, 19/32, 5/8, 21/32, 11/16, and 23/32. Continuing in the back row from the left, the sockets are 25/32, 27/32, 7/8, 29/32, 1 Inch, 1-1/32, 1-3/32, 1-5/32, and 1-9/32. By comparison with the earlier No. 2 set, it's likely that the missing sockets are the 17/32 square and 31/32 hex sizes. (The 17/32 square would be needed as a coupling when using the universal with the extension.) In retrospect, the sockets should have been arranged differently for the photograph, with a gap at the far left in the front row and between the 29/32 and 1 inch sizes in the back row. As with the previous example, this set has had some of the sockets replaced, with five of the 17 sockets marked with the Mossberg M-Diamond logo. The remaining 12 sockets are marked with the fractional size but no company identification. The later No. 2 Champion set was supplied in a wooden box with dimensions (in inches) 12.7 wide by 5.6 deep by 2.7 high. No markings were found on the outside of the box. One other minor detail to note: the hinges for the cover of this set are mounted on the top and bottom of the back rails. Earlier Syracuse Wrench sets generally mounted the hinges on the back side of the box. Fig. 19. Syracuse Wrench No. 770 11/16-Drive Ratchet, with Inset for Side View. Fig. 19 shows a Syracuse Wrench No. 770 ratchet with nominal 11/16-drive, acquired as part of the later No. 2 Champion pressed-steel socket set. The ratchet is stamped "Syracuse Wrench Co." and "Syracuse, N.Y. U.S.A." with the SW-Hex logo on each side. The overall length is 10.0 inches, and the finish is nickel plating. In this ratchet the drive gear is broached with a nominal 11/16 square opening, suitable for driving standard pressed-steel sockets on the outer surface. The ratchet is similar in appearance and construction to the Mossberg No. 355 Ratchet. Fig. 20. Syracuse Wrench 1/2-Drive Universal. Fig. 20 shows the unmarked 1/2-drive universal from the later Syracuse Wrench No. 2 Champion pressed-steel socket set. The overall length is 3.8 inches, and the finish is plain steel. Fig. 21. Syracuse Wrench No. 752 11/16-Drive 7 Inch Extension, with Inset for Marking Detail. Fig. 21 shows an 11/16-drive Syracuse Wrench No. 752 7 inch extension from the later No. 2 Champion socket set. 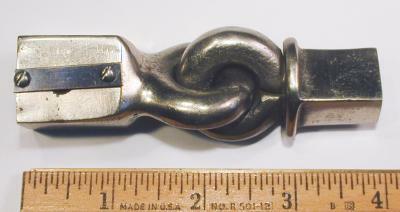 The shank is stamped "Syracuse Wrench Co." and "Syracuse, N.Y. U.S.A." with the SW-Hex logo on each side. The extension has been forged with 11/16 and 1/2 square ends, with the larger end driven by a ratchet and the smaller end driving a socket from the inside. The extension has been badly twisted by excessive torque. Fig. 22. Syracuse Wrench No. 852 11/16-Drive 9 Inch Extension, with Inset for Marking Detail. Fig. 22 shows an 11/16-drive Syracuse Wrench No. 852 9 inch extension, stamped "Made in U.S.A." with two SW-Hex logos on the shank. The overall length is 9.5 inches, and the finish is plain steel. The extension has been forged with 11/16 and 1/2 square ends, with the larger end designed to be driven by a ratchet. The 1/2 end then drives a socket using the inner opening. 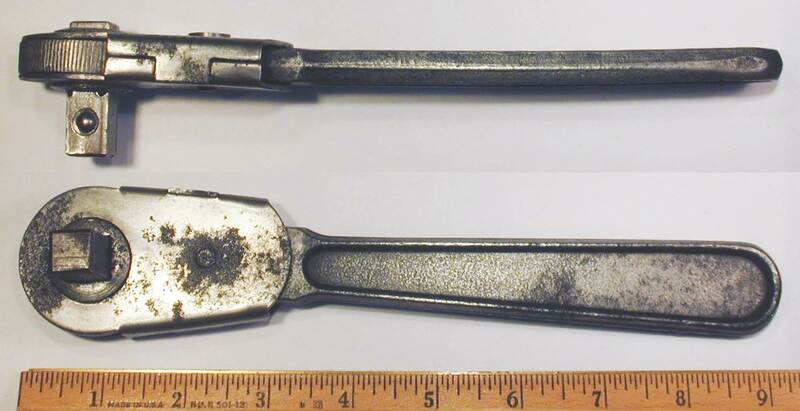 This extension was acquired as part of an unidentified socket set, which now appears that it may be a Syracuse Wrench No. 10 set. We recently acquired a Champion No. 10 socket set with pressed-steel sockets. The set is currently being prepared for display and will be added in the near future. Fig. 23. Syracuse Wrench No. 10 "Champion" Pressed-Steel Socket Set To Be Added. We recently acquired a Champion No. 12 socket set with pressed-steel sockets. The set is currently being prepared for display and will be added in the near future. Fig. 24. Syracuse Wrench No. 12 "Champion" Pressed-Steel Socket Set To Be Added. Fig. 25. Syracuse Wrench Valve Lapper, with Insets for Construction and Marking Detail. Fig. 25 shows a Syracuse Wrench valve lapper with an unusual swinging-handle design, marked with "Syracuse Wrench Co" and "Syracuse NY" forged into the handles. The overall length is 15.8 inches, and the finish is black paint.